The study looked at workers under “job strain.” That’s just a fancy way of saying that you 1) have piles of work to do, and 2) feel like you have zero control over your workload, your promotion chances, or the brain-numbing assignments your boss slaps on your desk. Strain leads to stress, which increases your blood pressure–the number one risk for heart disease–and could lead to a long list of other heart-damaging side effects, researchers explain. 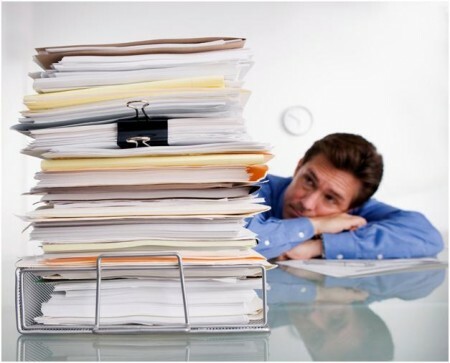 Do you feel constantly overloaded at work? Do you feel like there’s jack you can do about it? If yes to both–congratulations!–you have job strain. But even if you can’t control your workload, you can beat the heart-damaging effects of stress. Step 1: Sweat. A lot. A University of Missouri at Columbia study found that 33 minutes of high-intensity exercise helps lower stress levels more than working out at a moderate pace. What’s more, the benefits last as long as 90 minutes afterward. For a fast-paced, muscle-building, fat-torching workout that’s like nothing you’ve ever seen before, check out Speed Shred from Men’s Health DeltaFIT. The eight follow-along DVDs will change your life, one 30-minute workout at a time. Each hour, spend a minute perusing a funny blog. Periodic breaks help you process and absorb new information, increasing your efficiency, says Cleveland Clinic psychologist Michael McKee, Ph.D. During your hiatus, take 10-second breaths–inhale 4 seconds, exhale 6–to bolster your heart’s ability to recover from stress. Researchers at the University of Bristol in England discovered that when stressed-out men consumed caffeine by themselves, they remained nervous and jittery. But when anxious men caffeine-loaded as part of a group, their feelings of stress subsided. Just make sure you avoid The 6 Worst Coffee Drinks in America. An Australian study published last month found that just 15 minutes of yoga–practiced right from an office chair–can reduce stress. Got a chair? Sitting in it right now? Great–try The Office Chair Workout. If you’re looking forward to unwinding after a grueling work week with a cold brew, hold off on happy hour for 30 minutes: Drinking while stressed out actually prolongs your anxiety–even when you limit yourself to two–according to a study at the University of Chicago. The easy fix: Tell the crew you need to run errands before hitting the bar. Then take a quick walk, browse Best Buy’s new releases, or flip to SportsCenter to check the scores. Tug your lobes (lightly) and move them in circles in opposite directions for a count of 10, advises massage therapist Elizabeth Cornell. The motion moves the tentorium membrane in your head, which can relieve stress. You’ll also be in fighting shape for charades. If it doesn’t add much time to your commute, drive on roads with more trees and grass–natural scenes decrease feelings of anger and frustration on the road, according to a study in the journal Environment and Behavior. Not an option? Put on your favorite band’s new album. Drivers who faced frustrating and irritating congestion felt less stressed when listening to music they enjoyed, according to a study in the Journal of Applied Psychology. If the boss suddenly dumps a big project on you, try not to say, “I can’t do this. I’m gonna get fired.” (Try particularly not to say this in front of your boss.) Instead, present him with a schedule outlining when things can be done. What was overwhelming is now under control and open to negotiation, says James Blumenthal, Ph.D., a psychologist at Duke University. Think your job is stressful? Try taking a gig as a New York City firefighter. One study found that every time a fire alarm bell rings, a firefighter’s heart rate jumps up to 150 beats per minute–about the same rate as a moderate jog. Firefighter Matt Long says his fire station received between 4,000 and 5,000 calls like that each year. “After a bad day, we deal with things through laughter,” Long says. To land the perfect practical joke, make sure you know the person well, always help clean up, and be ready to have your target prank you back.